The Educational Services make the museum heritage available to all those who intend to visit one of the locations where Museo delle storie di Bergamo is organized, starting from 5-year-olds. 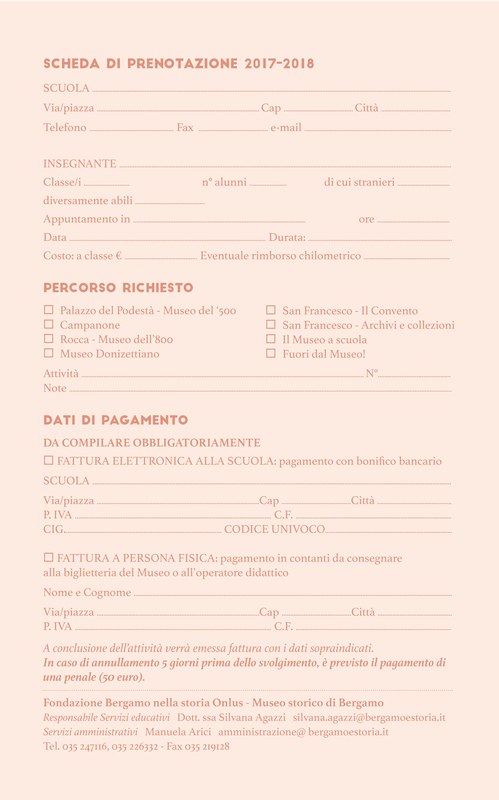 Personalized proposals that connect the museum exhibition with the materials stored in archives and warehouses and the history of the city of Bergamo. For schools, there is the opportunity to deepen a historical theme in several meetings investigating different types of sources (photographs, diaries, letters, posters…). The school remains the privileged recipient of the proposals for historical study elaborated by Museo delle storie di Bergamo. 95 proposals are articulated among visits, laboratories, projects, theatre activities and the new “Cuccioli” section, dedicated to children aged 4 and 5.